Starring Saoirse Ronan, Laurie Metcalf, Tracy Letts, Lucas Hedges, Timothée Chalamet, Beanie Feldstein, Lois Smith, Stephen McKinley Henderson, Odeya Rush, Jordan Rodrigues, Marielle Scott, Jake McDorman, John Karna, Bayne Gibby and Laura Marano. Distributed by A24. 93 minutes. Rated R.
Greta Gerwig has made a career as an actress playing smart, sweet, funky and neurotic urban dwellers. She has become sort of an indie icon, sometimes tragic, sometimes goofy, always intriguing. In recent years, she has been exploring life behind the camera – she co-wrote Frances Ha and Mistress America with her boyfriend, director Noah Baumbach. Lady Bird is her first leap into working solo – and directing as well as writing – and she has come up with one of the best films of the year. And she doesn’t even act in the film. Nonetheless, her quirky sensibility suffuses Lady Bird. The seemingly autobiographical film tells a relatively simple story, that of an outcast teen (Saoirse Ronan) desperate to escape the provincial lifestyle of her hometown of Sacramento, CA, and go to college in New York, less than a year after the World Trade Center disaster. In the meantime, she is going through a violent tug-of-war with her nagging mother (Laurie Metcalf), an unfeeling seeming woman who seems to revel in knocking her daughter down a peg. That simple explanation does not do justice to this smart, funny, and surprisingly touching film. Ronan does a terrific job in exploring the levels – for good and for bad – of the title character (whose given name is Christine, but she decided to rename herself the more florid Lady Bird). Metcalf also reaches some amazing depths in her character, refusing to let her character become a mother-from-hell cliché. Also spectacular is Tracy Letts as the father, an unemployed depressive who feels the desperate need to keep the peace between his wife and daughter. There are lots of other fascinatingly offbeat characters and plot threads in Lady Bird, but I won’t tell you about those. It is better to allow them to just flow over you in the theater. 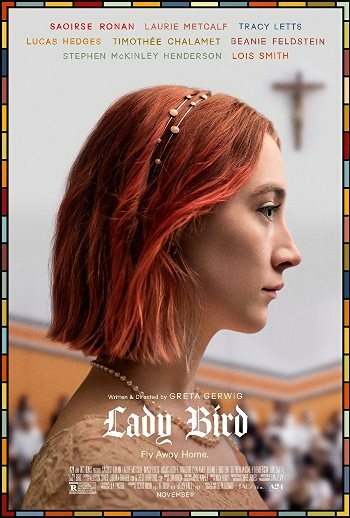 Lady Bird may be a little too small and too arty to completely catch on. However, it is one of the best looks at a teenage girl in years. It makes even good similar films – like say Edge of Seventeen – seem a little calculated. It seems that Greta Gerwig is the real thing as a writer/director, as well as being a fantastic actress. It’s pretty impressive to see that much talent in one person. Tags: Bayne Gibby, Beanie Feldstein, Edge of Seventeen, Frances Ha, greta gerwig, Jake McDorman, Jay S. Jacobs, John Karna, Jordan Rodrigues, Lady Bird, Laura Marano, Laurie Metcalf, Lois Smith, Lucas Hedges, Marielle Scott, Mistress America, movie review, Noah Baumbach, Odeya Rush, PopEntertainment.com, Sacramento, Saoirse Ronan, Stephen McKinley Henderson, Timothée Chalamet, Tracy Letts. Bookmark the permalink.